A Short and Happy Guide to Mediation is for lawyers who want better results from mediation, mediators who want to become more effective, and students who want to explore dispute resolution as a career. What disputes should be mediated? Who gets to be the mediator and how do you choose the right one? How can preparation for a mediation lead to a more successful result? What are some things about the practice of mediation these days that we can improve? A Short and Happy Guide to Mediation addresses these and many other intriguing questions. 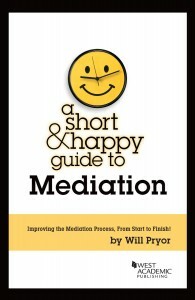 A Short and Happy Guide to Mediation is available to purchase on Amazon. Read a review of Will’s new book at The Texas Lawbook. Learn More about Will’s new book here.